Bouthaina Shaaban - Who is Bouthaina Shaaban? Writer and women’s rights activist, Bouthaina Shaaban was born in Homs, Syria in 1953. She studied English Literature at Damascus University, and completed her postgraduate studies in English Literature at Warwick University in England, where she also received a doctorate degree in 1982. There she met an Iraqi doctorate candidate in physics whom she later married. In her book “Both Right and Left Handed, Arab Women Talk About Their Lives” she writes about her father’s reaction to her marriage. A Hundred Years of Arab Women Novelists (in Arabic), 1999. Arab Women: In the Twentieth Century (in Arabic), 2000. Poetry and Politics: Shelley and the Chartist Poets (in Arabic), 1993. Both Right and Left Handed: Arab Women Talk About Their Lives in English, 1991. She has published numerous articles on Arab feminism and women’s literature. 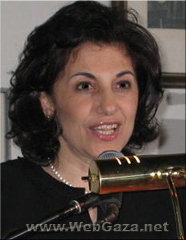 Bouthaina Shaaban has held several government and non-government posts in Syria. Beginning in 1988-2002 she served as Advisor to the Minister of Foreign Affairs. From 1993-2003, she was an interpreter for the Syrian president, and 2000-2005 she was Vice President of the Arab Writers Union in Syria. She spent a year as Director of Foreign Media, and has been Minister of Expatriates since 2003. Since 2000 she was Editor in Chief of the Foreign Literature Quarterly Al Adab Al Ajnabiyya, published by the Arab Writers Union. In 2005, she was nominated for the “1000 Women for Noble Peace Prize 2005”, and the same year received the Award of “ The Distinguished Woman in Governmental Position”, League of Arab States, Cairo, Egypt.